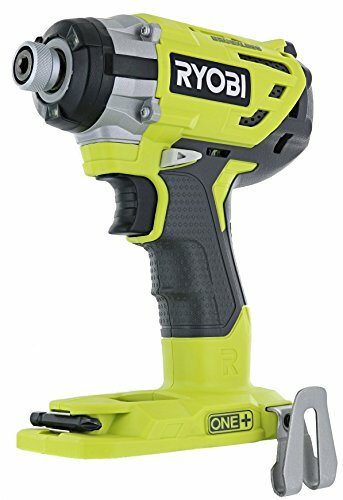 If you need to perform heavy duty fastening tasks, like driving lag bolts through your porch, then look no further than the brushless Ryobi P238 impact driver. This shoves out high amounts of torque while remaining at a comfortable, compact size and light weight for maximum control. Beyond its powerful motor, which can rotate at about 3,100 RPM (which can be affected by a 3-speed switch depending on how heavy duty your job is), there are a variety of features to give you the greatest amount of control possible. A gripzone rubber molding over the pistol grip lets you handle this even in slippery conditions, and a belt clip on the side lets your hands be open for multitasking on complicated jobsites. Additionally, a tri-beam LED is located just under the keyless chuck, activating when you pull the trigger so your work subject can be illuminated without distracting shadows. Whether you're working around the house or on the professional jobsite, you'll find tons of utility packed into this product, courtesy of Ryobi. Item is shipped in bulk packaging.